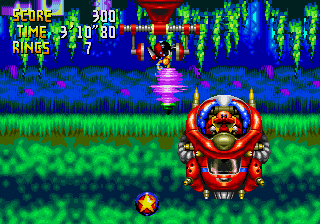 At the end of Chaotix's Botanic Base Act 5, Robotnik holds the partner in the air with a large claw, leaving the player suspended by Ring Power. Robotnik flies around below, electrifying his machine to try to harm the hanging player. The battle ends when the machine is destroyed and the Dark Ring within disintegrates.